With a greenhouse full of seedlings, and a workshop full of wedding flowers, it is really starting to feel like the 2018 season has begun – even if the weather outside doesn’t quite seem to realise it is supposed to be spring. The warmest day of the year so far found me flowering up local venue, Rowheath Pavilion for a lovely, leafy wedding. It’s always great to see familiar places transformed with wedding decor and flowers – a bit like seeing them put on their posh frock for a gala dinner. For this wedding, Jo, the bride wanted leafy arrangements to decorate the wooden pillars which run the length of the hall, and chair posies and altar ends to tie in with the leafy rose gold theme.I always think that chair posies add a lot of impact for such small details and are great because they can be re-used as ‘occasional’ flowers elsewhere in the venue after the ceremony. Jo’s were popped into small vases and used to decorate the cake table and card table. Here, seasonal posies of tulips, frilly ranunculus and wild damson blossom, coaxed into bloom indoors during the week before the wedding, were used to bring a pretty floral flourish to the aisle. Lanterns, like those shown in the photo (above) can also be used to host chair posies, tied to decorate their tops, once the ceremony is over, and placed to flank a doorway onto a terrace, or to light the way up a flight of steps. 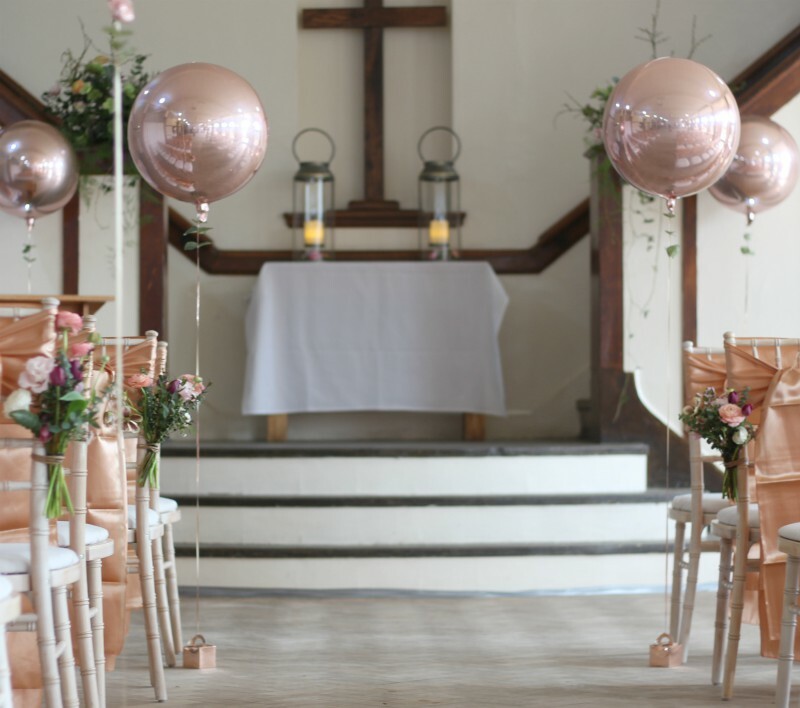 If you’ve chosen to have a circular table in the middle of the room, rather than a traditional top table for your wedding meal, you could also use your pew end arrangements as chair back decor to mark you out as ‘the special ones’. When planning your wedding flowers, always consider how arrangements can be re-used in different locations throughout the day – you might as well make your flowers work hard for your money! ← After the Beast’s departure….